Lets break these down a bit more, the tracking is a function that has existed since the beginning of the field tech console. 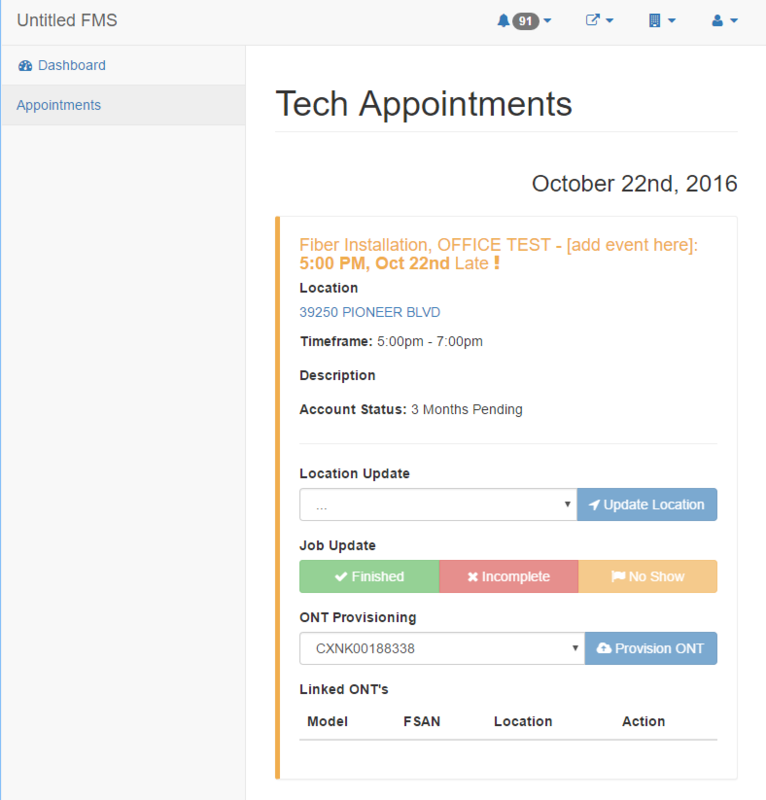 Depending on the requirements of the calendar event, the technician is required to update their status in order to complete a job. Different jobs have different statuses. Fiber installs consist of four required updates before a job can be completed. Enroute, arrival, installing and clean up. Customer appointments have only three. Enroute, arrival and clean up. 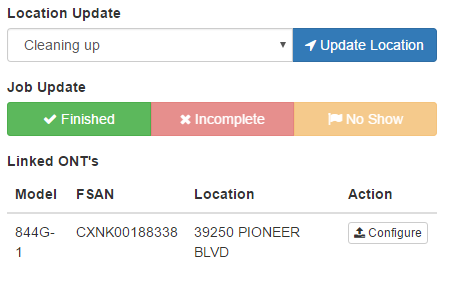 When a tech leaves for their job, they update the status to enroute. Upon arrival, the status is updated. If the tech is installing fiber, once they start installing the line or ONT, they update the status to installing. Once they are done, they update the status to cleaning up. Each status record records the time and approximate location of the job. This builds a timeline of how long it took to complete each operation. Management can view this information live though the FMS, and can further piece together jobs in a given day to see how much time the tech was idle or being utilized. For example, a contractor has three fiber installs to perform in a given day. Their time card reflects seven hours of work, meaning each job takes 2.33 hours. If the installer is updating their statues correctly there should be a nice distribution between finished times and enroute updates to the next job. If each job only takes one hour to complete, some time stamps would reflect abnormal behavior. It could be time and distance between jobs, time between status updates, etc. It is not fool proof, but it makes it hard to fake consistently over time if you have historical data to compare to. One such flaw is faking the amount of time it takes between installing and cleaning up. If an installer finishes the job, and sits in their truck for 45 minutes before updating the job to cleaning up or finished, how does management ensure that the data is accurate? These kinds of issues are fairly difficult to track and eliminate. Using other data, this kind of issue can almost be removed from the equation. In Calix based systems, the access platform will send out syslog messages when ONT’s arrive or depart from the network. If that time is compared to when the status was updated, a manager can know that if a job took 45 minutes after the ONT came online, abnormal behavior has occurred. It’s these kinds of data metrics that can allow managers to easily track performance of contractors, and take corrective action when needed. Now, that explanation took a bit longer than expected, but hopefully you get the idea of how this kind of data is useful. Lets discuss the latest improvement in the field tech console. Integration of Calix’s Compass suite with ONT provisioning through the FMS. With the new addition of Activate in the Calix Compass suite, it required that I start integrating our FMS software more with their cloud based system, rather than just CMS. The transition to using both systems has proven to be a little bit clunky for now, and adds anywhere between five to 20 seconds of provision time when creating records within the FMS. But, with our size, and the amount of jobs being processed, 20 seconds equates to very little in terms of money. I’ll have to make another post talking about the new CC+ integration, but for now, I’ll just link to the public repo. When a tech has completed provisioning the ONT, they set the status of the job to Cleaning Up. 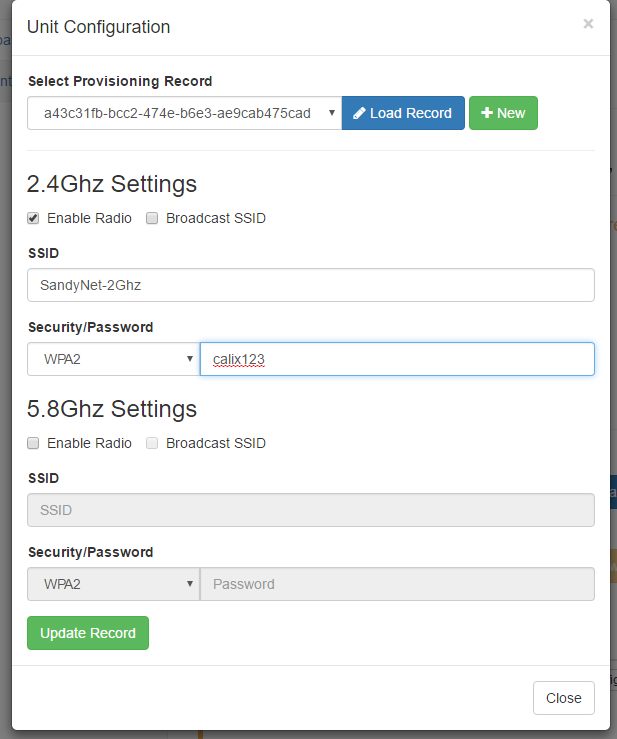 This update removes the ONT provision wizard from the screen, and prompts the tech to provision the WiFi. The tech has the ability to modify an existing provisioning record, or create a new one (only one record can be stored). These changes occur instantly if the ONT is online and operational. 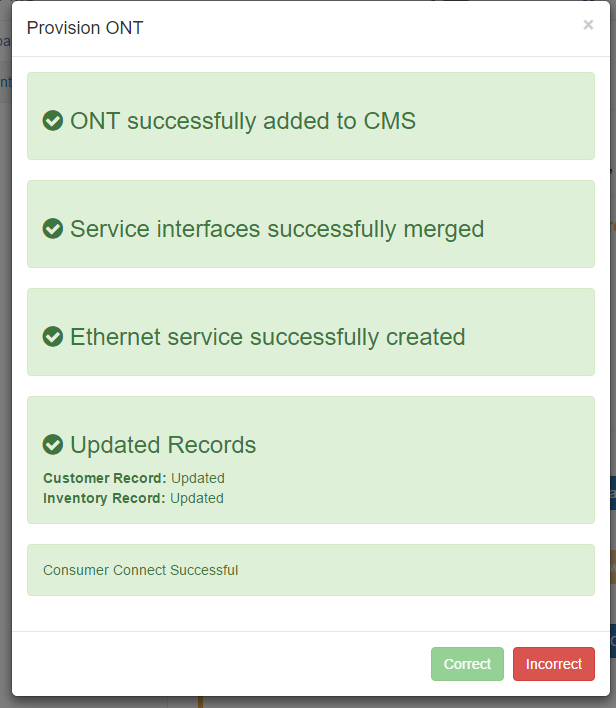 If the ONT is still provisioning, once it performs its check-in with Consumer Connect, it will download the provisioning record. The idea of this is to allow an installer to provision, and configure an ONT for a customer without pulling out a laptop, or connecting any wires. In addition, management can gather valuable statistics on installs. 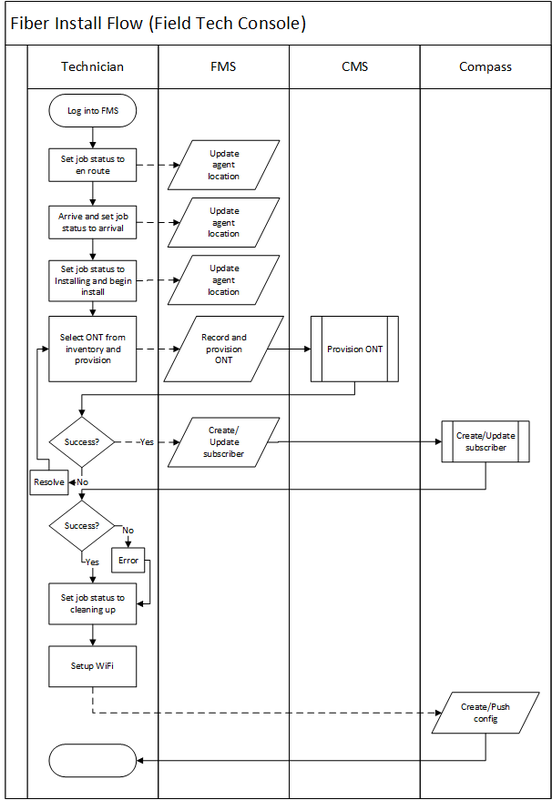 The following flowchart depicts the actual sequence and parties involved in one job or cycle. This idea will go live in two days on 10/24/2016. A goal of this implementation is that it will generate one less call to support to get WiFi configured. Being an organization that prides itself on adding more value to the customer, a one stop, quick and accurate experience has shown to increase customer retention rate. This project has created two major milestones. It has gotten me to update the field tech console, fixing many of the bugs that existed previously, and it has finally gotten me to write the CC+ API. The PHP Class is publicly accessible on my Github page, and the like to repo is above. In the future, once development dies down a little, I am hoping to focus on increasing the effectiveness of the processes and sequences I have created. Utilizing what I am learning on operation management classes will hopefully allow me to benchmark, optimize and replace existing flows in an attempt to reduce overhead and cut out waste.